Back to the Indian food another day… To mix it up, here’s a new recipe I dreamed up for last night’s dinner. I’m a big fan of cooking with what I’ve got. I’m way to lazy to make a special trip right before dinner time to go get that one last ingredient. So when I got a little hankering for fish tacos, I wasn’t about to go running out for tortillas when I had perfectly good tortilla chips in the cupboard. Close enough! 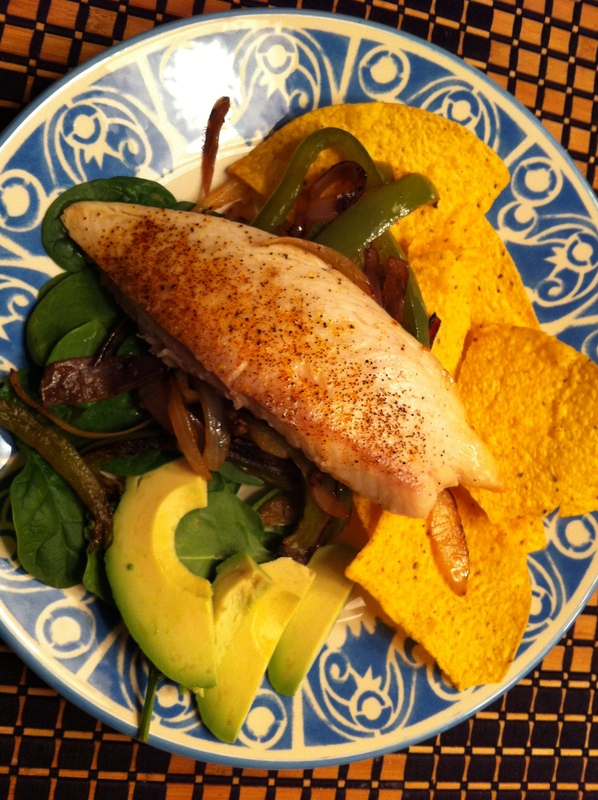 I had the fresh tilapia that was on sale this week, green peppers, onions, and avocado. Add the chips and salsa, and we got our makeshift fish tacos. These were certainly husband-approved, and not nearly as messy to eat. Authentic? Probably not. But they are a surprisingly quick and easy dinner for a weeknight treat. 1. Preheat the oven to 400°F. While the oven is heating, spray a glass baking dish with PAM or a similar nonstick spray, or lightly oil. 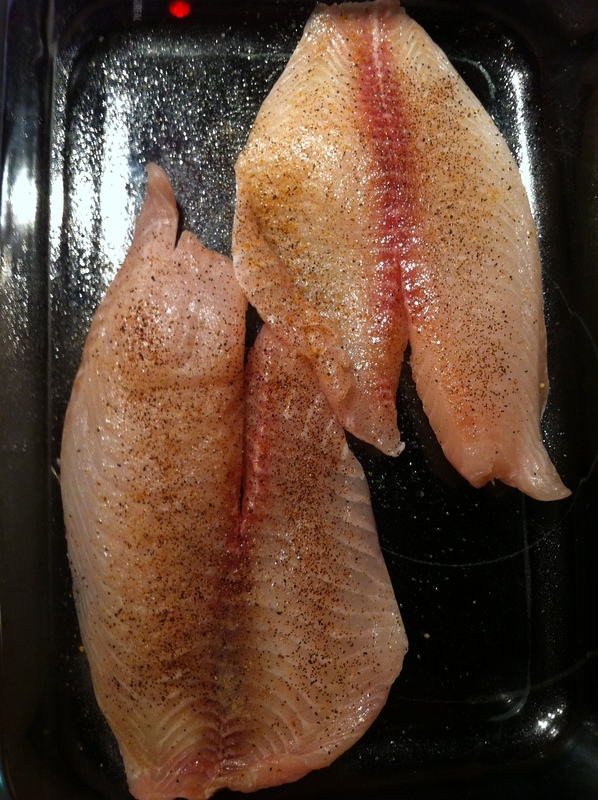 Place the tilapia in the dish, spray with PAM, and sprinkle with the seasonings to taste. I used a slightly heavy hand with all but the cayenne since I knew I would be eating the fish with other, less seasoned ingredients. I had purchased 1.32 lbs from the store, so I went ahead and baked it all for some planned leftovers (yum!). 2. Bake the fish for 15 minutes. While the fish is baking, saute the onions and green pepper in the olive oil on medium high heat. Season with salt, pepper, and additional spices to taste. I used a little cayenne here, maybe 1/4 tsp. Cook until some of the vegetables are just starting to burn a little. 3. Arrange the tortilla chips, spinach, and avocado on two plates. Layer on the peppers and onions and the fish. Top it off with the salsa, and serve to a hungry friend. By the way, this also happens to be a very healthy dinner! Great for all of us attempting New Year’s resolutions but not willing to give up delicious food. Previous Post Previous post: A wedding, giant stone oven, henna hands, oh my! Just to let everyone know. The fish reheats very well the next day. I rarely eat fish, but this recipe looks delish! I must try it! Thank you! Let me know how it turns out for you!